Most people today have heard of Moore’s Law and the explosion of the number of transistors in modern technology, but if you are of the younger generation, the word “vacuum tube” sparks only faint recognition. In fact, some younger readers may not recognize the term at all. 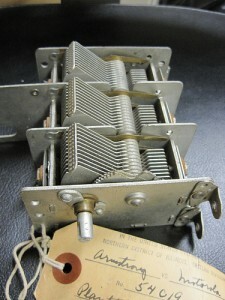 But this device was the forerunner of the modern transistor, which is used in nearly all electronics today. 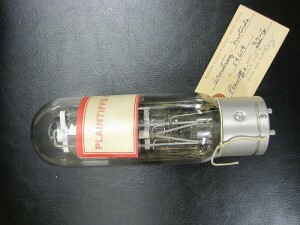 Edison discovered the principle that would lead to the vacuum tube while developing a carbon-filament electric lamp. In 1883, during the course of his experiments he observed a dark film on the inside of the glass which caused the carbon filament to burn out. Curious as to the cause, Edison hung a tiny metal plate inside the bulb and found that a small current passed from the hot filament to the metal plate, but not in the other direction. This “Edison phenomenon” was regarded as an academic curiosity for many years, until it was picked up by John Fleming in 1904. Fleming used this discovery to create the “Fleming valve,” a device that would induce current flow in one direction and not the other. This is called the “diode” today (a term that many will remember from Physics class). In 1906 Lee De Forest found that he could place a fine wire mesh between the filament and the metal plate and control the current flow through the circuit. In effect, he made a “faucet”; if the voltage on the grid was high, current would flow. If the voltage on the grid was low, the current would be blocked. Think of this as a faucet: by using a little bit of your own energy to turn the knob, you can control a large flow of water. Similarly, the De Forest “audion,” or vacuum tube used a small voltage from an incoming radio signal to shape a large amount of current provided locally. 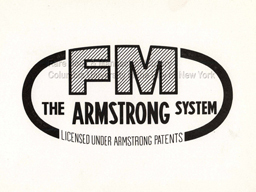 You can see a picture of a vacuum tube from the E.H. Armstrong collection at the right. The wire running through the center is the cathode, the wire spiral is the mesh, and the thick black outer shell is the anode. This vacuum tube was originally used in the litigation case Armstrong vs. Motorola. Next, I’ve included a picture of an interesting device below. Do you recognize it? 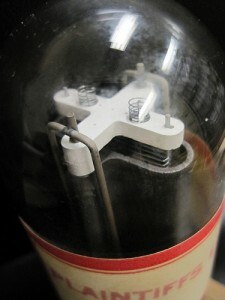 This is a air variable capacitor. By rotating the plates outwards, the surface area is decreased and the capacitance drops. This entry was posted in Popular and tagged air capacitor, diode, Einstein, Fleming, Lee DeForest, Motorola, vacuum tube on April 19, 2010 by Jen Howard.